OK, I dropped Brett off at the airport tonight so we now we can all talk about him. He’s catching a redeye back to Florida and I’m spending one more night at some anonymous hotel in the Los Angeles area. Actually, I’ve got no lurid tales to tell of life with Brett. We’ve done the business trip thing so many times that it’s just second nature now, and we know how to get along like an old married couple. (No wonder that when we go to Palm Springs we sometimes get offered a single King bed.) And this was a particularly successful week, starting with our two nights in Denver, then two nights in Tucson, two nights in Palm Springs, and one night in Anaheim. The summary: we got it all done and we had fun doing it. Driving back from LAX after dropping Brett off I was starting to feel the L.A. vibe and start to regret that tomorrow I’ll be heading back home. The car was bouncing along the uneven concrete of “the 105” (as locals say it) with a 72-MPH/ 72-degree breeze blowing in the open windows and KLOS taking classic rock requests on FM. I was zipping and merging according to the whims of Garminita, listening to Jimi Hendrix and getting whiffs of the Pacific salt when I was near LAX. It all felt like an experience I could only have in mythical southern California. You know that California has a huge car culture, which is why I always feel most at home here when driving. 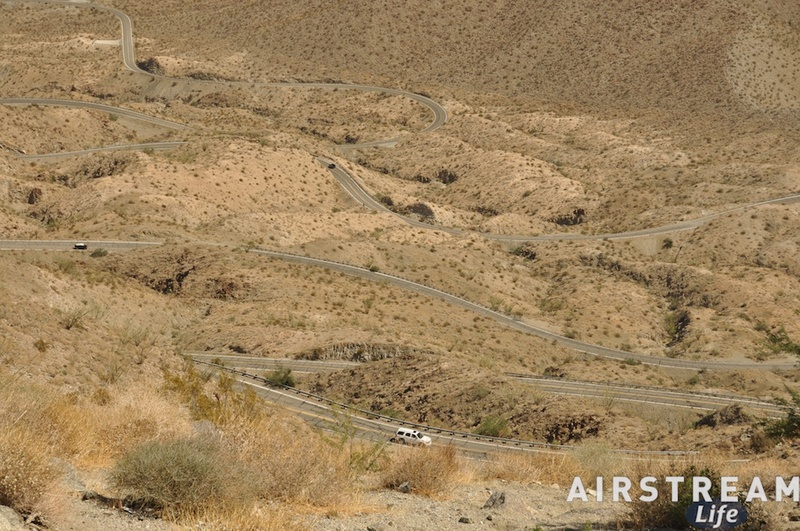 Yesterday we took the twistiest possible route from Palm Springs to Los Angeles. 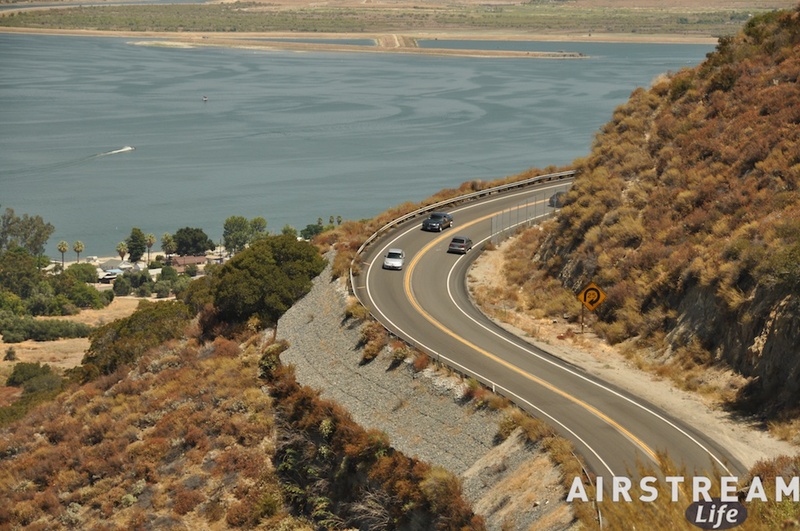 The highlights were the climb out of Palm Desert along Rt 74 (the “Palms To Pines Highway” pictured above), the climb up from Lake Elsinore (below), and the Ortega Highway. With stops at scenic overlooks, the drive took us most of the day and I didn’t regret it for a second. I’m tempted to take the same route back. Towing the Airstream I tend to pick straighter routes, but now that I think back to it we have towed on curvy and narrow roads without hesitation. I remember a few roads that we probably shouldn’t have been on (89A heading south to Sedona, for example) and a few that people recommended we avoid with a trailer (coastal Rt 1 in California comes to mind). In every case the effort required to navigate the road with a 30-foot Airstream was well repaid in scenery and memories. So I’m not surprised that the road less traveled in California was a great choice yesterday. Well, that was yesterday when we had all day to kill. Today was a different story. Our goal was to visit a few clients and friends in the area and get tours of their facilities. I like to have a good handle on the resources available for Airstream owners, and it’s always useful to snoop around in hopes of finding an interesting restoration project or contact person for a future Airstream Life article. Our first stop was M.E.L. Trailer in Orange. Named for the three partners in the business (Mike, Erasmo, Lucas), this little shop is turning out some very nice work and seems poised for even better things in the future. By the way, Mike Keenan is the organizer of the very popular annual Pismo Beach vintage trailer event. This year he offered 300 spaces and got 600 applications. Right down the street is Area 63 Productions, run by Uwe Salwender. I’ve known Uwe casually for years, since he wrote a short article for Airstream Life, but we had not met in person until last February at Modernism Week. Like M.E.L., Area 63 is doing great restoration and customization work and so I’d be proud to capture Uwe as an advertiser in Airstream Life sometime in the near future. Bill K., another Airstreamer and blog reader, happened by while we were visiting, and he joined us for lunch in town at The Filling Station. 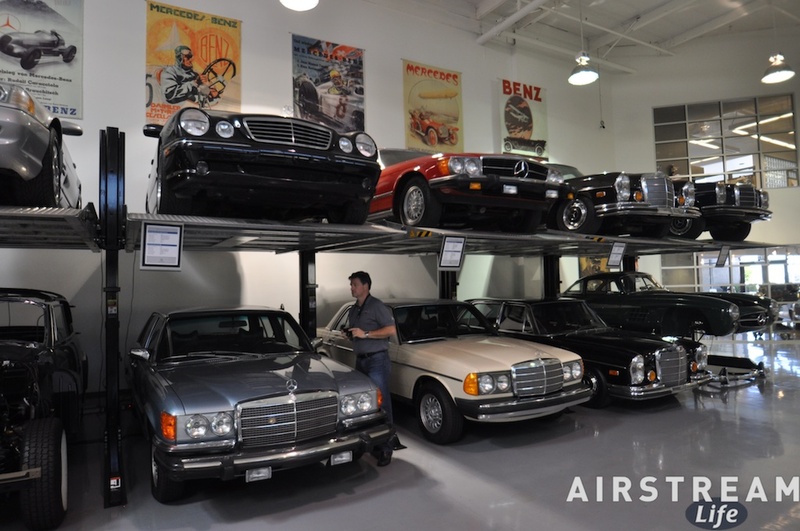 Since we were in the area, and because Dr. C suggested it, we zipped down to the Mercedes Benz Classic Center for a quick look at their Museum Of Unattainable Classic Cars. That’s not actually what they call it, but it certainly struck me that way, especially the ones on the upper rack that could be glimpsed from below but not fully viewed. Still, the cars are cool, and I am appreciative to Mercedes Benz USA for opening their doors in Irvine to let us drool for a few minutes. Our final stop was C&G Trailer up in Bellflower, run by Rod and Darlene Beltran. These folks have been in the Airstream repair business for 48 years, and Rod is the second generation since his father worked at the Airstream plant when it was located in the L.A. area. Amazingly, they’re far from burned out; they seem to thrive on it. Their shop has the unique appeal that comes from being a long-time specialist. In every corner are stacks of vintage parts, so much that we spent half our time there just marveling at all the goodies that we could use. C&G Trailer has been an advertiser in Airstream Life for seven years and I love ’em for it. Just recently I sent soap opera actor Ingo Rademacher to them for an interior makeover of his Airstream Safari 30 bunkhouse. The trailer came out great and we’re going to have a photo spread on it in either the Winter 2011 or Spring 2012 issue. We had a few minutes to kill before dinner, so we got the car washed (all hand wash & dry, $7.99, only in L.A.!) and cruised around town a bit since the temperatures were perfect in the evening. Having accomplished all of our work goals and feeling the summer air, I’m pretty sure we were both thinking that it would be much nicer if the other suddenly disappeared and was replaced by a friendly female. Not that we don’t enjoy each other’s company, but that’s what happens after a week on the road without our ladies. Brett will be back to his girlfriend tomorrow. I, on the other hand, face a long and quiet drive back to Tucson tomorrow and no prospect of romance for a while. I’ll use the time to digest the events of the week and prepare for whatever lies around the corner. Temporary Bachelor Man still has a little time left on his clock. I just wanted to say hi…. I envy your trip from LA to Palm Springs — Deke and I have taken that and we love the drive and the windmills. Safe travels and I hope we get to see you soon!